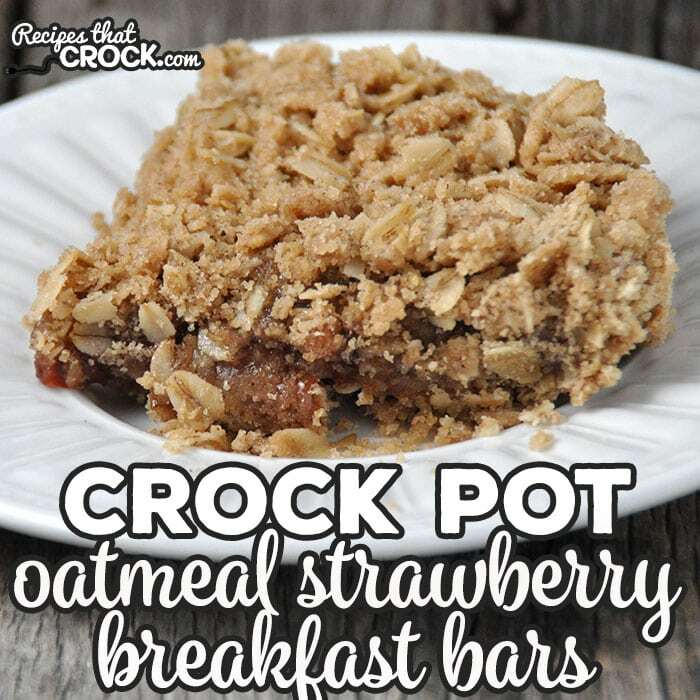 Crock Pot Oatmeal Strawberry Breakfast Bars - Recipes That Crock! 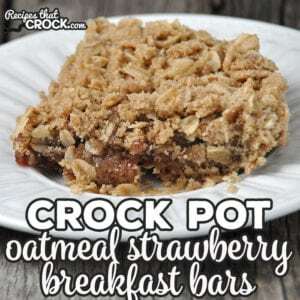 These Crock Pot Oatmeal Strawberry Breakfast Bars are perfect to make at the beginning of the week for a quick breakfast for the rest of the week! So yummy! When I first saw the recipe in Gooseberry Patch’s 303 ‘Round the Clock Recipes, I was hooked. You know how much I love making, eating and sharing breakfast recipes with you folks. 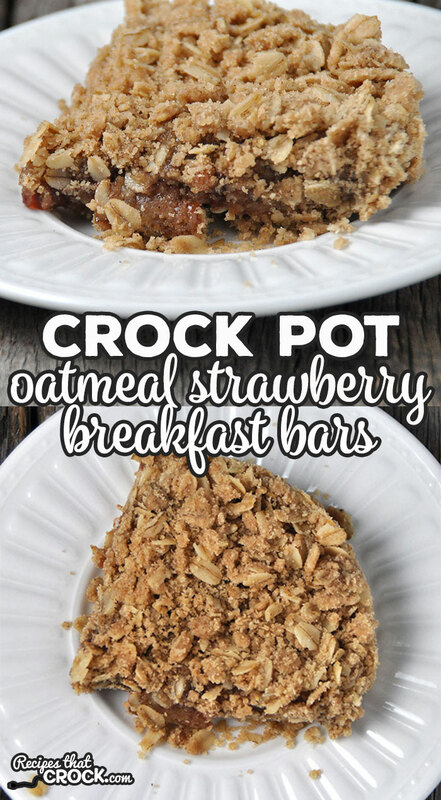 This Crock Pot Oatmeal Strawberry Breakfast Bars recipe did not disappoint! In standard Aunt Lou fashion, I made an adjustment here and there, but as you know, I encourage you guys to make adjustments yourselves! After tasting this recipe, I had all kinds of ideas of how to tinker with it. I’d love to know your thoughts down in the comments too! This is such a simple recipe. I’d love to make some variations! Mix together your dry ingredients. Cut your butter into your dry ingredients until everything is well combined and crumbly. Put 2 cups of the crumble aside. 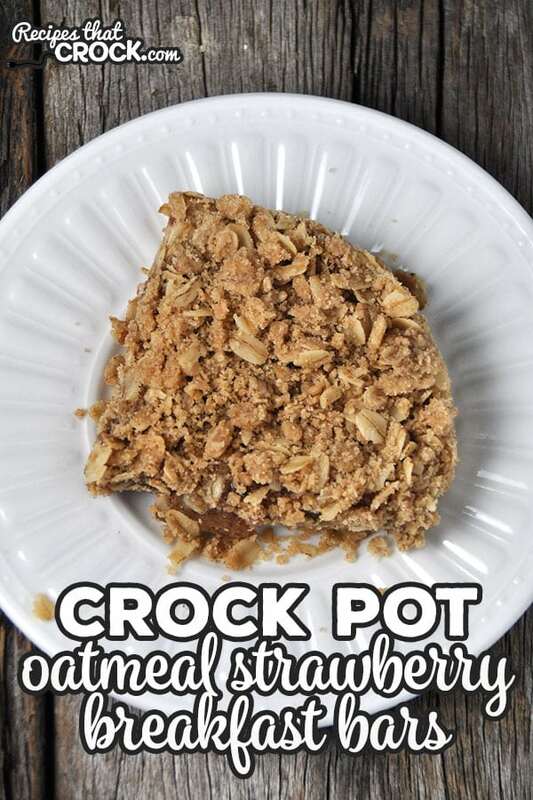 Press the remaining crumble in the bottom of your lightly greased 6-quart crock pot. Spread your strawberry preserves across the top and sprinkle on your reserved crumble. Cover and cook on high for 2 hours, turning halfway through if your crock pot doesn’t cook evenly. Remove your insert and place it in a safe place to cool before cutting your bars. I thought I had walnuts, but couldn’t find them. So I made my first batch without them. However, they are good either way. So add them or don’t. You decide! Cut your butter into your dry ingredients until everything is well combined and crumbly. Put 2 cups of the crumble aside. Press the remaining crumble in the bottom of your lightly greased 6-quart crock pot. Spread your strawberry preserves across the top and sprinkle on your reserved crumble. Cover and cook on high for 2 hours, turning halfway through if your crock pot doesn’t cook evenly. Remove your insert and place it in a safe place to cool before cutting your bars. I thought I had walnuts, but couldn't find them. So I made my first batch without them. However, they are good either way. So add them or don't. You decide! this sounds so easy and delicious! gonna have to try this!